The ergoCentric airCentric Chair might look like your typical desk chair but be advised - once you take a seat, there is no going back, ergonomically speaking. While traditionally upholstered and modular in design, you can customize the seat cushion to your liking and choose your chair's features, giving you a personalized seat that brings you to that next level of work. The airCentric's back is designed in layers with a honeycomb rib design, maximizing its strength, and features a proprietary airflow back design that pairs the breathability of a mesh chair with the support of a foam upholstered chair. The waterfall edge on the airCentric's seat alleviates pressure on the back of your legs as you recline and contoured edges redistribute your weight for more ideal ergonomics where you need it. The ergoCentric airCentric Chair is available with your choice of seat adjustment mechanisms. If you're unsure about which one to order, give us a call at 1-800-531-3746 and we'll help you decide. Synchro mechanisms work well in offices for data entry and clerical work, as well as institutional settings such as computer labs, study tables and libraries. The chair requires a minimum of manual adjustment, as the seat and seat back are synchronized to stay at the optimal angle. Multi tilt mechanisms offer a full range of adjustments and are great for continuous multiple shift use and general office use. Synchro glide offers the same features as the regular synchro mechanism, but with an independent back angle adjustment. Boaroom mechanisms offer fewer adjustments than other mechanisms. This mechanism would be more appropriate for a conference room than a daily desk chair. The ergoCentric airCentric Chair is available in your choice of seat sizes. The Airflow seat features airflow molded polyurethane foam to provide better breathability. The ergoCentric airCentric Knit Mesh offers the cooling airflow of mesh, and for that reason we recommend it, but the airCentric Chair is also available in dozens of other options. Air Knit is a breathable mesh fabric composed of 100% polyester. This lightweight fabric will keep you cool throughout the year, yet it is still durable with an abrasion rating of 200,000 double rubs. Spot clean with mild soap and water. The ergoCentric airCentric Chair is available with your choice of seat foams. While the standard dual density is soft and supportive, for extra comfort we recommend upgrading to the memory foam or triple density foam. 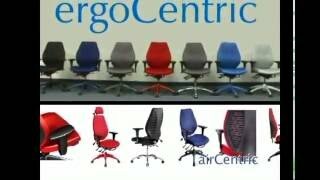 The ergoCentric airCentric Chair is available with a variety of caster styles. For most applications, we suggest the standard dual wheel nylon casters, however, if you are unsure please give us a call at 1-800-531-3746. The cylinder is the part of the chair that joins the bottom of the seat to the base. It allows the seat of the chair to raise and lower. Sometimes the cylinder is called the "lift" or the "vertical elevation ram". The ergoCentric airCentric Chair is available with a standard, short, or tall cylinder. For most people, we recommend the standard. While the ergoCentric airCentric Chair offers good support, those who want extra lumbar support should consider upgrading to air lumbar. Air lumbar is inflated by hand with an easy-to-use pump and adjusts to the level of firmness you desire. The ergoCentric headrest has three pivot points. That makes it extremely adjustable within its 7" vertical and horizontal range. It is constructed of durable aluminum to withstand years of re-adjustment. $505.00 List Price: $720.00* The list price is the same as the MSRP (Manufacturer's Suggested Retail Price). It may not necessarily be the price at which the product is sold.